A Roman blind will take your room design to a whole new level. Cords at the back draw the blind up into large, soft horizontal pleats, bringing in a sumptuous extra furnishing element. Unlike curtains which need plenty of fabric to create the folds, a Roman blind hangs flat at the window, so it is cost-effective way to introduce a luxurious fabric without busting your budget. Ready-made Roman blinds are available, though there’s much more choice with made to measure blinds. Follow our guide to Roman blinds to find the perfect window blinds for your rooms. Whether you’re after a relaxed, coastal look or a more formal effect, a Roman blind is up for the challenge. Dressy enough for a living room, these blinds can also bring a calming effect to a bedroom, brighten up a kitchen and will even add a softer touch to a bathroom, provided they’re kept clear of splashes. To bring extra texture and warmth to a relaxed living room scheme, these blinds can be layered with curtains. Find more window treatment design ideas for your living room in our gallery. Plains, prints, whatever works for your room, a Roman blind can be made up to suit. Bold designs work well, as do stripes which are accentuated by the pleats. Go for a made to measure blind from Vanessa Arbuthnott and you can add contrasting borders to frame the design and draw extra attention to the pleats. Cotton and linen fabrics work beautifully, and thicker fabrics also make great Roman blinds, though the pleats won’t be as crisp. Fine fabrics such as silks look gorgeous but these delicate materials are prone to fading and damage by the sun so artificial silk such as polyester is a good alternative. Discover more smart window dressing ideas for bedrooms. Find out how to mix patterns and plains successfully, too. Roman blinds are often lined, which improves the way the pleats fall. Not only will lining help to cut out more light, it also prevents the tapes and cords from showing on the right side of the blind. Choose blackout lining if the blind is for a bedroom. Thermal lining will help to keep the heat in and the cold out and for extra help against draughts opt for interlining as well. Inserted between the fabric and lining for warmth, this extra layer will give the blind a more sumptuous look. Find the best blackout curtains to match your Roman blinds. The blind can be set within the window recess or outside it. Hanging the blind above the frame will maximise the light, since the top pleat won’t then block the window. It’s best to allow at least 45mm fabric overlap on each side and the base (around 75mm would be even better), so that light won’t creep around the blind edges. If the sill protrudes, the blind can finish there. Find a measuring guide at Terry’s Fabrics. Made to measure blinds are supplied according to your own measurements so use a metal tape and be precise. Alternatively, you can relax and let a blind company measure up then fit the completed blinds for you. If you can use a sewing machine, you can make your own Roman blind – they’re relatively simple and if the window isn’t too wide you won’t even need to join widths of fabric but can simply cut one piece. Lining is optional. Tapes sewn to the back of the blind take rods to hold the pleats firm, and cords are threaded through the tape or through rings to raise and lower the blind. The blind is then fixed using Velcro to a wooden batten or a track above the window. For safety reasons, the cords or sidewinder chain must be out of reach of young children, so you must install the safety device provided with your blind kit, or buy a safety blind cord lock. Find Roman blind kits and safety devices at John Lewis. Discover more window dressing ideas for period homes. Why stick with standard roller blinds for sloping skylight windows when a specifically designed Roman blind can give the room an altogether more dressy effect? The blind runs in side rails and is not attached at the top or bottom so it’s easy to raise or lower. There are no visible cords and it can be removed easily for cleaning. 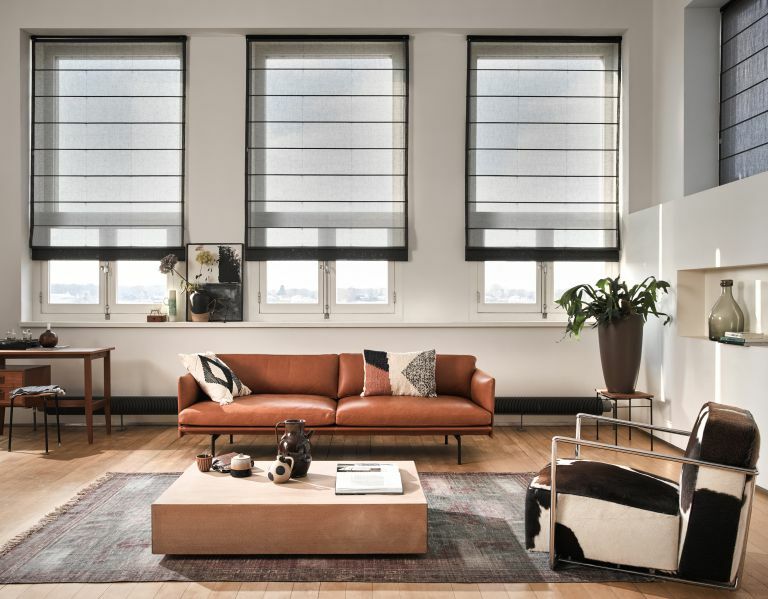 Find these blinds at Velux. Find more blinds for loft windows and glazed extensions in our guide.